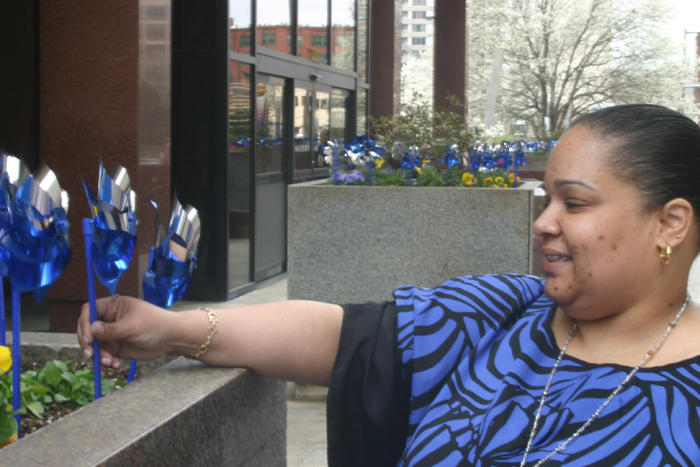 Judy Cruz-Ransom, staff member of the archdiocesan Office for Child and Youth Protection, plants a pinwheel as a symbol of the innocence of children. 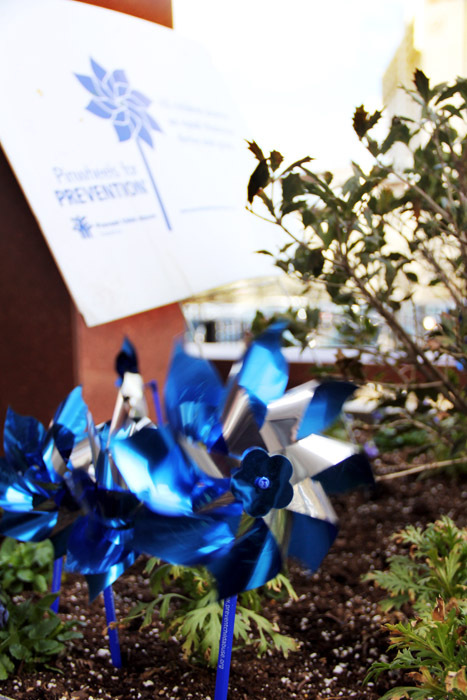 The Pinwheel Garden at the Archdiocesan Pastoral Center in Philadelphia is an initiative of the office during April, which is National Child Abuse Prevention Month. Is there anything as beautiful as the joy in a child’s eyes watching a colorful pinwheel spinning in the breeze? 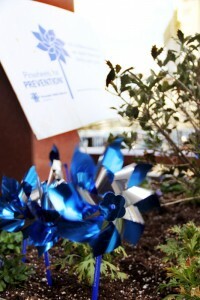 Protecting that innocence of children and young people and safeguarding them from harm is the goal of the Archdiocese of Philadelphia’s Office for Child and Youth Protection, which distributed shiny metallic blue pinwheels this month to parishes and other communities as a reminder of National Child Abuse Prevention Month in April. The office’s Safe Environment Program in place in all parishes, schools, religious education programs and institutions of the archdiocese aims to protect children through the preventive medicine of training and awareness for children and adults. Children learn “they have a right to say no, that they have a voice and they can speak up and find a trusted and safe adult,” said Leslie Davila, director of the child and youth protection office that trains young people and the adults who interact with them in all church settings. But adults must recognize they are responsible for intervening for a child, Davila said. Last year through the Safe Environment Program 103,192 students in Catholic parochial and high schools, plus public school students in parish religious education programs, received “personal safety lessons” to prevent sexual abuse. Some 7,000 adults including clergy, teachers, parish and school staff, plus volunteer coaches and other leaders also were trained to be protectors and advocates for children. The office’s programs are part of the Catholic Church’s larger effort to address the scandal of clergy sexual abuse of children that came to light in 2002. By 2004 most U.S. dioceses had implemented an office and programs similar to that of the Philadelphia Archdiocese, in response to the U.S. bishops’ “Charter for the Protection of Children and Young People” which lays out norms for dioceses and religious orders pertaining to the issue of child abuse. Nationwide in 2013, 4.6 million young people were trained in safe environment programs, along with 99 percent of priests and Catholic educators, and 98 percent of volunteers in a church setting, according to the annual report on child protection efforts of the church in the U.S., issued March 1. Because of the child protection efforts in the archdiocese, a child who is now an eighth grader has had personal safety training every year of his or her academic career. And the adults around that student have been screened with background checks and trained to be a protector and model. “That has been a big accomplishment over the past 10 years,” Davila said. In addition to training adults – clergy, staff and volunteers — who have regular contact with children in church settings, the archdiocese also requires criminal background checks that must be renewed every five years. In this respect archdiocesan norms are ahead of other sectors of society, Davila said. Under current Pennsylvania law, school employees who have direct contact with children are required to notify the school within 72 hours of any arrest or conviction of a serious offense that would disqualify them for employment. The law does not require school employees to renew their background checks, though public school districts may ask employees to do so. And although the law requires training in child abuse recognition and reporting for all school employees who have direct contact with children, volunteers are not required to do so. A new package of legislation signed by Gov. Tom Corbett last month strengthens child protection in the state by broadening the categories of people considered “mandatory reporters,” those who because of their direct contact with children are required to report suspected child abuse to law enforcement. Despite the efforts of many organizations working on behalf of children, Davila knows child abuse does happen, especially in families. Davila knows that if a person with bad intentions wants to harm a child, he or she will seek out settings where children are. Preventing such people from abusing a child might not always be successful. 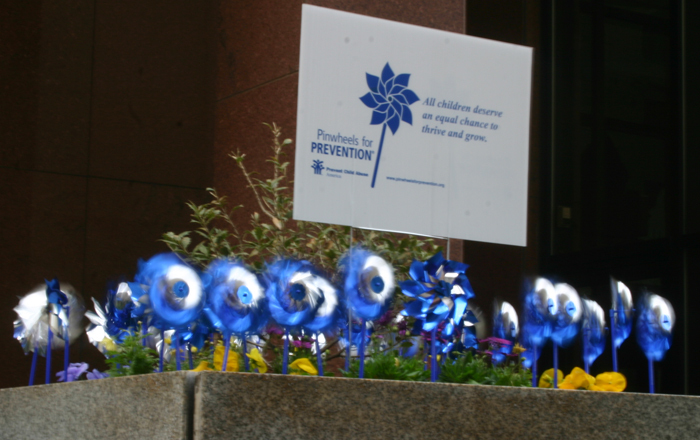 In addition to parish-based activities to display pinwheels in April, Davila described new tools to spread the message of safe environment training and its goal of building a network that protects children. Training is now available for adults on the Child and Youth Protection Office’s website, and she’s using Twitter to communicate broadly through social media.